Cost effective, avoid theatre costs. Full procedure pack (excluding drapes) for convenience and to avoid delays. With or without Blue Line Ultra® Tube. Unique Blue Line Ultra® introducer eases passage of tube into stoma minimising trauma. Blue Line Ultra® Tube features tapered tip, soft clear flange and Profile Soft Seal cuff. The Ultraperc® single dilation percutaneous tracheostomy kits utilise the widely accepted Seldinger guidewire technique. 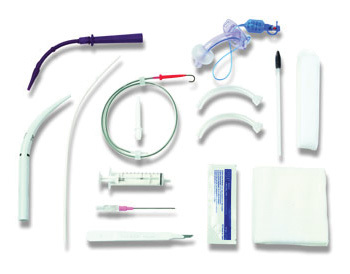 The kits are available with or without the innovative and popular Blue Line Ultra® tracheostomy tube.